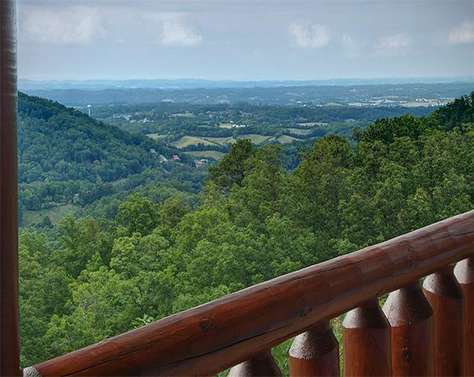 Animal House is a Beautiful 2 bedroom cabin located close to the Great Smoky Mountains full of wild animals and beautiful views. 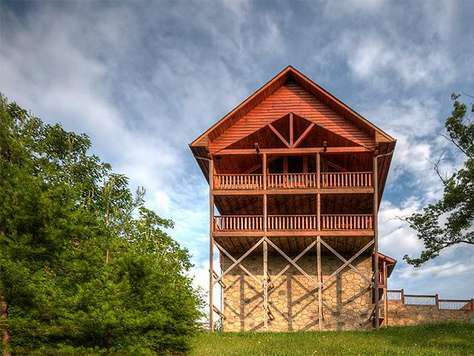 Animal House is a cabin that brings you closer to nature snuggled on top of the mountain in Starr Crest Resort. 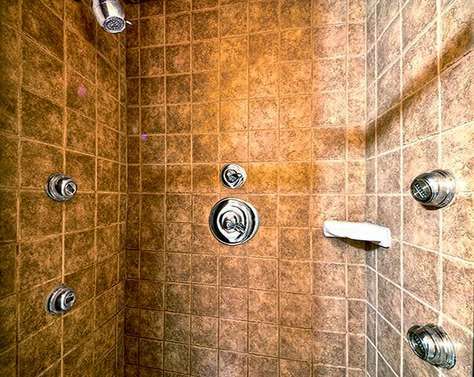 2 bedrooms with King beds and 2 full bathrooms. 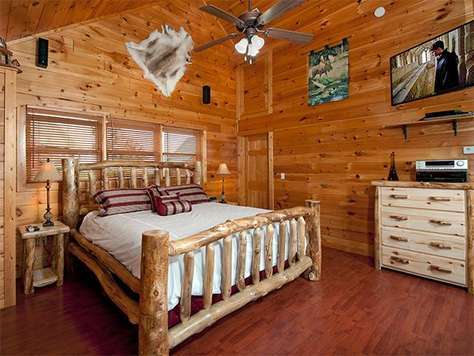 The Master bedroom is located downstairs. The second bed is located upstairs in the loft area. 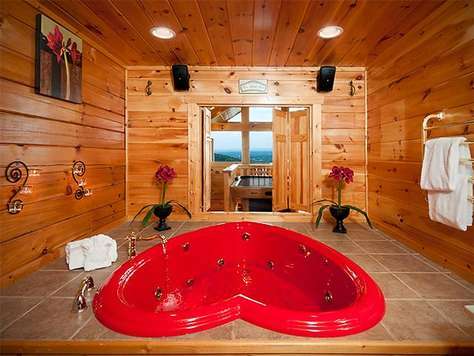 This cabin offers both an indoor Jacuzzi and an outdoor hot tub for couples to enjoy. 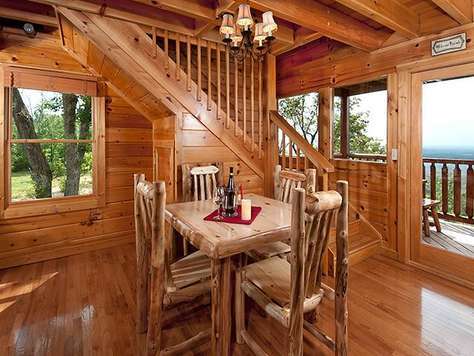 This cabin comes with a fully stocked kitchen and is furnished with Aspen Log Furniture. You will be able to relax in front of the Electric Fireplaces, snuggle up and enjoy the movie of your choice with the DVD player and big screen TV. 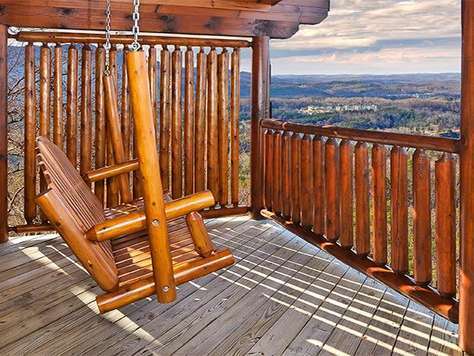 From the deck, take in a breath taking view while sitting rocking chairs. 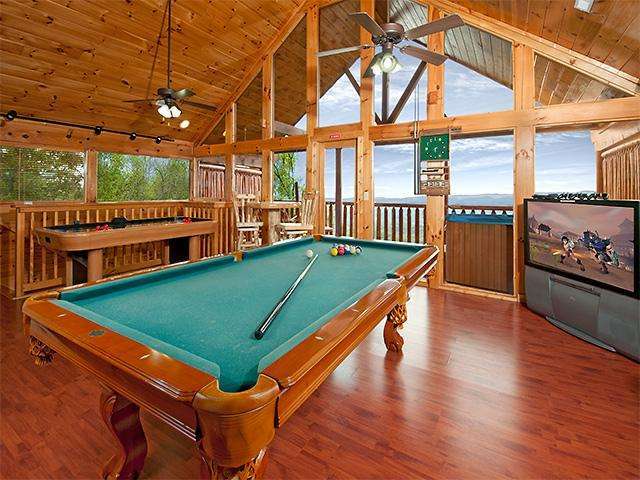 For your entertainment, this cabin comes equipped with a pool table, air hockey table, and a classic video arcade system. 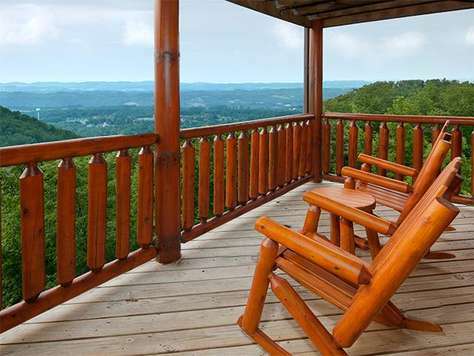 This cabin is located in Starr Crest Resort, a 4 star resort located adjacent to the famous Dollywood theme park. The resort features an outdoor pool, playground and pavilion. We stayed at Animal House and it was the best! The view was fantastic as advertised and the cabin had everything we could have wanted. The upper-level bed was so comfortable there was no question of a great sleep every night. 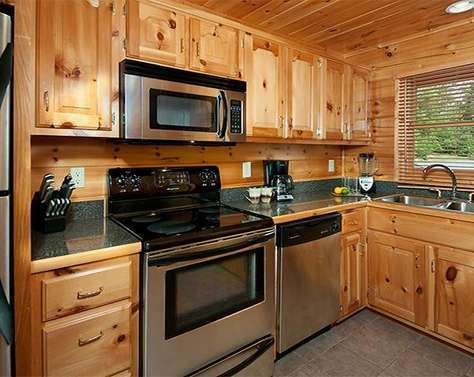 The cabin was very clean on arrival and the kitchen had every amenity. 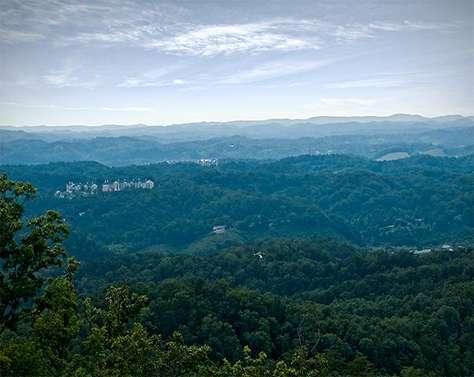 Location wise it’s right beside Pigeon Forge but super easy to get to Gatlinburg and the National Forest or Sevierville in the other direction. Mishap on my part with the dates I had booked and the Outrageous staff sorted it out no problem. The only downside was leaving! We had a great time at Animal House cabin. It wasn't far from town and easy to get to. The cabin was really clean and had everything you needed. We loved all of the large flat screen tv's in each room. We had a blast playing pool, air hockey and video games. We really enjoyed hearing the train whistle during the day and the fireworks at night from Dollywood. We will definitely come back and stay. Thank you for a wonderful cabin for our vacation! Animal house was perfect. 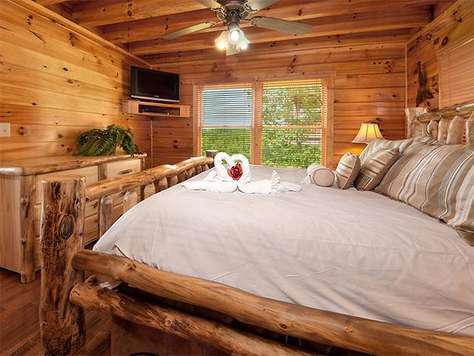 This was the cleanest & nicest cabin we have ever stayed at in the 5 years we have been coming to the Sevierville/PigeonForge/Gatlinburg area. We have had issues with bugs in one of the cabins we stayed in previously through another cabin management company. 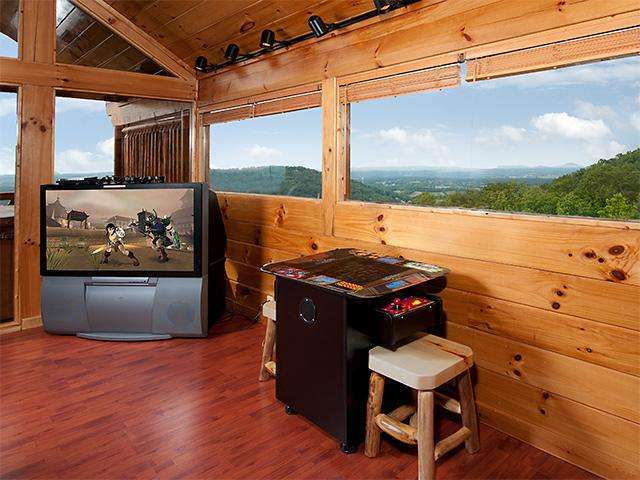 We know we are going to have bugs when we stay in the mountains, but your cabin was almost bug free! We had one flying ant & that was it! Your pest control is excellent. And your cleaning crew is awesome. The minute we first opened the door to the cabin--it smelled clean and fresh. We did not have one complaint about our stay at your cabin.We have been showing pictures of the cabin to our friends & family, and they all were impressed. We would definitely recommend your cabins to everyone, and we will definitely stay in your cabins again! My family and I really enjoyed our stay at animal house. It was one of the nicest places we stayed at. Everything was clean and any issues we had were fixed that day. We even drove around the area looking at other cabins and none seemed to be as nice as yours. We are already talking about coming back and booking with you again. Thank you, John Prinkey. We just stayed in Animal House. 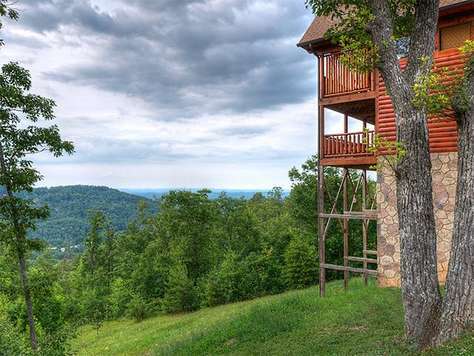 I have stayed in several cabins in the Smoky Mtn area over the past several years, I will never stay anywhere again but Outrageous cabins. The most beautiful views I have ever seen, the cabin was wonderful. No complaints, would recommend your resort to anyone and everyone. Thanks you so much for making my vacation wonderful. I am emailing to give you a review on our stay with you this past month. I went to the reviews page but could not find a place to write a review. 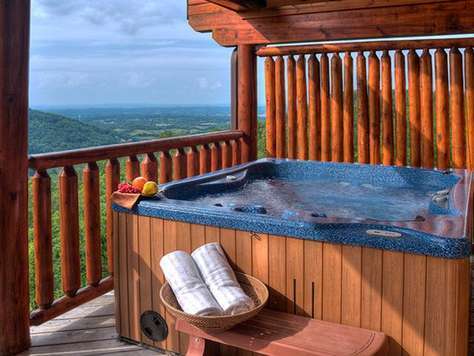 That said, my husband and I stayed for the first time with Outrageous Cabins in February, 2013. 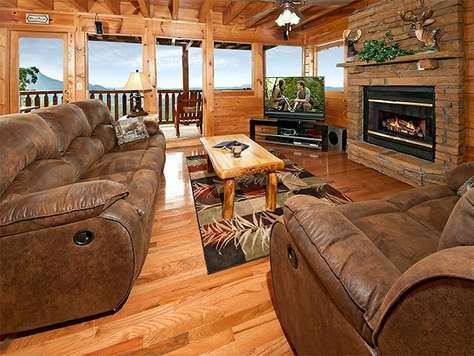 The cabin that we rented far exceeded our expectations! 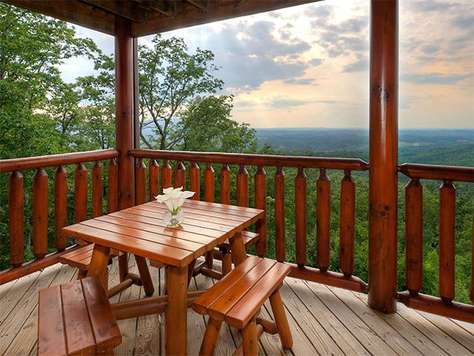 We have rented cabins in the area in the past but were either slightly disappointed in the cabin itself or the view. I must say, both the cabin and the view we had during this stay were spectacular! The cabin was clean and had plenty of room for the two of us. It was well appointed and beautifully decorated. When we first arrived and went inside, I was very impressed by the layout and the furnishings, especially the little extra touches like the welcome doggy made out of towels and the heart with a rose in it also made out of towels on the bed in the Master bedroom. (it was Valentine’s weekend). The view was incredible and that was just the first floor. The first words out of our mouths when we went up the stairs and saw the loft area was WOW. It had everything! 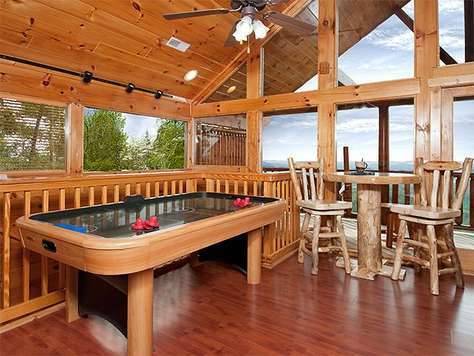 Pool table, game console, air hockey, large flat screen TV, Stereo, and a Jacuzzi tub with surround sound throughout. The view from up there was even more breathtaking. The decks are large and the top deck had a swing and a hot tub. The only thing missing from that picturesque scene was snow. Before I could get the words out of my mouth, it started snowing. That night it snowed nearly all night and the view of the cityscape was breathtaking. When the sun rose the next day, the view that we had of the snow capped Smoky Mountain was like nothing I had ever seen. The cabin literally had everything we needed, and even the beds were comfy. We will definitely stay again, and will recommend Outrageous Cabins to everyone!